“The Gospel-Centered Mom is a huge gulp of refreshing air for moms who are in the thick of raising kids. It takes your eyes off of your performance and places them on the one who performed perfectly for us.” - Jessica Thompson, coauthor of "Give Them Grace." ...and who needs a dose of grace even more than she needs a shower and a cup of coffee. I'm a mom of four boys ages six and under and I need GRACE. I need to see how Christ's death and resurrection effect me NOW, in the never ending pile of laundry and dishes. I want to hear His voice above the din of talking Elmo and screaming tots. I wrote this for me. I wrote it for you. Are you ready for a turning point in your motherhood? "Sara's writing is authentic and venerable, but not just so that you can laugh alongside her exciting life with four boys. Her ultimate goal is to give weary moms applicable gospel truth that enables joy and abundance in Christ." - Emily Jensen, mom to 4 boys and author of From The Jensens. "Sara Wallace explores motherhood with heartfelt realism - not from a place of Pinterest perfection, but from a place of gospel accessibility. My suggestion? Grab a gaggle of mommy-friends and pick one day a week to meet in someone's living room for a Gospel-Centered Bible study play-date." 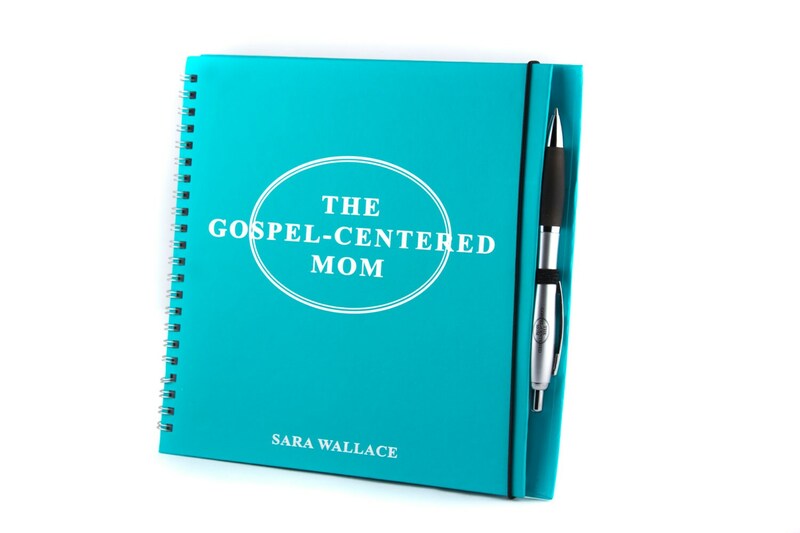 "Sara Wallace writes with fresh honesty and droll humor about facing our "mommy mess up moments" and how moms everywhere can still point their children's hearts to the gospel in the process. I finished the book, wishing there was more! And, wishing I had had this gem forty five years ago when my firstborn arrived. This is a primer for motherhood and makes you want to get out your journal, jot down scripture, cut and paste, commit to memory and remember to breathe when chaos threatens to turn your world upside down. In gospel-centered teaching, she shows how she strives and struggles to guide and lead the hearts of her four small children to Jesus while steering clear of the dangers of legalism at the same time. This compact little book is loaded with sound doctrine and truth. Ms. Wallace succeeds in revealing that we can't make every moment count, but, we can have that one moment come along that can change our children's lives for eternity. A must read for all gospel-centered families for sure! I also love the format of this book. It looks and feels like your very own journal, complete with pen and blank pages for important notes." "I LOVE this devotional/study. I am a mom (obviously) and the way this is written is easy to take chunks here and there when you have time. Sara is an amazing and eloquent writer. She presents the gospel in a way that is relevant to anyone whether they are hearing it for the first time or the millionth time. I highly recommend this." "My husband bought this for me for mothers day. I have been working through it this summer and am being so richly blessed by The Gospel Centered Mom. Ladies if you haven't checked it out yet you need to. I didn't realize how much I had lost sight of my gospel identity and the gospel in general. This booklet is a great re-direct and has brought to light so many heart issues (praise the lord). It's awesome! It is also the perfect amount of time for a busy mom or a mom sneaking in some time with the Lord amidst cleaning, fixing snacks and laundry." "Absolutely wonderful study! Can't recommend it enough!" "I highly recommend this study to any mom who is searching for encouragement in the amazing journey of parenting! Sara does a wonderful job of encouraging mom's to stay focused on the Gospel while enjoying their role as mother. As a mom of 4 young children, this study has not only encouraged my heart but has also helped me to refocus my heart." "Love this devotional! It is both theoretical and practical. Wish the author would write one on marriage next." "Sara Wallace covers a lot of material in 14 very short chapters. This is a book to read and then think about, or better yet, discuss with other moms. Her humorous examples from her own experience of being the mother of four young sons make the book easy to read. She writes first about the importance of being a woman aware of God’s grace in her life. “The concept of grace does not come naturally to our hearts. We have to put it there – daily! A lot of other things do come naturally: worry, ungratefulness, jealousy, discouragement” (p. 48, 49). She then moves on to the dangers of legalism in child training: “Our mom-identity will either be shaped by the gospel or by legalism. It’s not only crucial for ourselves that we choose the right one, but for our children as well.” (p. 55) I thought her best chapters were on how to discipline pointing to the grace of God instead of just disciplining to get desired behavior. I think this book would make a great gift to give to new moms." "There are many parenting books that attempt to answer the questions- How can I love my kids more? How can I make them good people? How can I make them love God? But what sets this book apart is the central message of Jesus through the Gospel. In each of the 14 chapters, Sara urges moms to let the Gospel message flood over their heart thereby directing children to the loving savior, Jesus Christ. What is the Gospel? Sara asks readers to define the Gospel in one sentence in the first chapter while noting, "Don't worry if you're stuck, we will continue to develop this idea." The Gospel is the redemption story of a perfect Savior, Jesus, that lived, died, and raised from the dead perfectly in my sinful place. This glorious message transforms everything in the life of someone who places their trust in Jesus, including the way we mother our children. I cannot recommend this book enough." Shipped very fast! Love the passages!